Organic lemon fruit spread; non-sugar. This delicious and tangy lemon fruit spread is made from organic Sicilian lemons, organic concentrated apple juice, and fruit pectin. It is very nice on bread or toast, with yoghurt, or partnered with a fresh goat cheese. 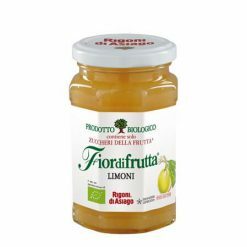 iordifrutta is processed at a low temperature to preserve the nutritional properties of the fresh fruit: vitamins, minerals, anti-oxidants and fibres. It has a low glycemic index and is gluten free.